Where’s the Beef (pt2), Bankruptcy and Fire Roasted Goodness. Well that didn’t last long. As soon as we find a suitable beef topping, it gets discontinued by our distributor so we can no longer obtain it. The search will have to continue I suppose. Last I checked the restaurants still had a small supply, so if you liked it, get it while you can. We are not going out of business and closing our doors. This action only affects company-owned stores (mainly concentrated in California) and does not affect independently owned stores such as ours (all the Round Table Pizza’s in Washington are independently owned and operated). While, like everyone else, we have been feeling the pinch of this economy, it will be business as usual for us. We are doing fine. You don’t have to worry about your favorite pizza going away. In other news, we have a new line of pizzas out. They are called the “Fire Roasted Pizzas” and feature a creamy Chipotle sauce. For $12 you can get a large Fire-Roasted Veggie which includes roasted onions and peppers, roasted tomatoes and green onions, for $14 you can get the Fire-Roasted Pepperoni or Fire-Roasted Chicken and Bacon pizzas. They include all the toppings listed on the veggie plus your choice of (yup, you guessed it) either pepperoni or chicken and bacon. I have personally tried the new pizzas and the new creamy chipotle sauce is very good, so come down and give it a try. We also have new Chipotle-Cheddar Twists as well which feature the creamy chipotle sauce if you want to try the new sauce, but just can’t stop ordering your favorite Round Table Pizza, add some Chipotle-Cheddar Twists to your order. One other bit of news. Our manager in Bellingham has been working with our alcohol distributors to bring in a whole bunch of new wines, featuring many good northwest bottles. We haven’t worked out the details yet, but we are thinking of hosting a wine-tasting event, where you will have the opportunity to sample some of these new wines paired with our gourmet pizzas. So keep an eye on our blog, or better yet, like us on Facebook so you don’t miss the announcement! Facebook just announced their new “Deals” program with Facebook Places. We are beta-testing this new program at our Mount Vernon store. For a limited time if you check in at Mount Vernon Round Table Pizza you will receive a coupon from Facebook to get 25% off your order. You just have to use either an iPhone or a smartphone that has an HTML5 enabled browser (Android, Blackberry w/ os6.0, etc). If you have an iPhone, just use the Facebook app to check in. If you have a different brand of smartphone, just go to touch.facebook.com on your mobile browser to check in. You will then be able to claim the deal, and then you just have to show your phone to the cashier when prompted to redeem the deal. Again, this deal is only for a limited time. If successful, we will continue to have different great offers available via Facebook Places. You can redeem it once per day, and it is only good for regularly priced menu items. You have to be at the store to check in, but if you don’t feel like coming in, you can still order online and save 15% by using coupon code Facebook15 when you check-out. Click Here for more information about Facebook Deals. *Please note. This offer is currently only available at our Mount Vernon location. We hope to offer it in Bellingham soon, but are waiting on Facebook. We will keep you posted. Also please remember, our crew does not develop iPhone apps and we do not work for Facebook. We just make pizza. Our crew members will not be able to offer any technical assistance in redeeming this deal. Accessing this deal on your smartphone is up to you, please contact Facebook if you are having technical issues. We are giving away Free Large Pizza coupons. All you have to do is check-in with either Foursquare or Gowalla, or send a location-based Tweet from Round Table, and you will be automatically entered to win a coupon for a Free Large Pizza! Free pizza coupons will be given away every Friday so keep checking in! More contest details available by clicking here. 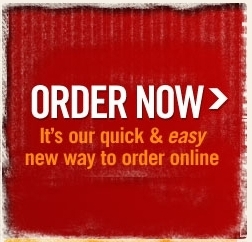 Our online ordering menu is easy to use, very convenient, and also has some very special online only specials available to you. Please keep in mind that this is a brand new system and we are still testing it out (hopefully with your help). We have done lots of internal testing, but if you do come across a problem, please let me know. I will reward you for your efforts! Also, you can save 15% off your order right now, just use coupon code facebook15 when you checkout! Also keep your eye on our Twitter and Facebook page. There will be some very special offers for our followers and fans! So we ordered up a bigger personal pizza cutting ring, made sure the personal pizzas could still squeeze into our boxes, and now we are serving our bigger personal pizza. We also decided to keep our personal pizzas and lunch specials at the same great price, so you get our new bigger personals for the same great price. So next time you are deciding where to have lunch, come on in and enjoy 15% more pizza for free. Our #1 lunch special (Personal Pizza, all-you-can-eat salad bar, and soft drink starting at just $7.49) is still one of the best lunch values in town, and as always we serve you the best pizza in Skagit & Whatcom county! One of the pillars Round Table Pizza has formed itself on is giving back to the community. We have always spent the majority of our advertising funds on donations to the community, rather than things like print advertising and mailers. One of our former employee’s, Travis Ketchum, has adopted this principle with his idea and website MyBigGive. The idea of MyBigGive is pretty simple; many major brands (for example, Amazon.com) will offer people a commission to drive traffic to their website. What Travis is doing is allowing you, the consumer, to have 70% of this commission donated to a charity of your choice just by going through his website MyBigGive when you shop (I usually choose Livestrong). The best part of MyBigGive is that it doesn’t cost you anything extra. You get the same great low prices from your favorite brands, but now, just by going through www.mybiggive.com when you shop, you also get to support your favorite charity. Travis has gotten MyBigGive off the ground mainly with just word of mouth. He has the support of several dozen brands already(Amazon.com, Newegg, North Face and Walmart are some examples)and many charities available for you to help support. Now Travis is trying to take MyBigGive to the next level. He has entered MyBigGive into Pepsi’s “refresh everything” contest. Pepsi’s “refresh everything” contest awards grants to ideas just like MyBigGive. 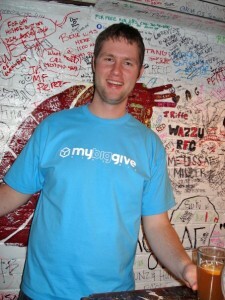 Travis is trying to win a $250,000 grant to help MyBigGive to take off. He needs your help though because the grants are awarded based on public voting. So if you have a few moments, please, Click Here to vote for MyBigGive. Even without winning the grant, you can help MyBigGive take off simply by using it when you make your online purchases. It takes less than 1 minute to use, it doesn’t cost you anything extra, and you get to support your choice of great causes. Why wouldn’t you useMyBigGive? So add www.mybiggive.com to your favorites, tell your friends about MyBigGive, help make a difference every time you shop (without costing you a dime extra)! We here at Round Table are very proud of what Travis has already accomplished with MyBigGive and hope, with your help, he can make this idea bigger than even he could imagine. Please note, that if he wins, none of the $250,000 grant will go to Travis or his salary and will all be utilized to help grow MyBigGive.